artSMart: MANOR GARDENS LIT QUIZ WHIZZES DO IT AGAIN! MANOR GARDENS LIT QUIZ WHIZZES DO IT AGAIN! Manor Gardens Primary School, a small public school tucked away behind the University of KwaZulu-Natal in Durban, has done it again by winning the National Kids Literature Championship this year, and all going to plan, will represent South Africa in the World Finals in Auckland, New Zealand in July this year. The school’s first team comprising Michaela Crankshaw, Jemma Kasavan, Jaskaran Rajaruthnam and Sam Walker took first position in the national champs held at St David’s in Johannesburg on February 24, 2018. Kids Lit Quiz is the brain child of Wayne Mills, a university lecturer from New Zealand, who came up with the concept 27 years ago. He calls it “The Sport of Reading”. He developed the quiz to promote reading for pleasure and to reward good readers in the same way that sports stars are rewarded by their schools and communities. The first quiz took place in 1991. In that first year 14 teams took part. Today it has grown into a hugely popular annual event spanning five continents with approximately 20,000 children participating in heats throughout the year. “The team will be up against tough competition from China, United Kingdom, USA, Canada, Singapore, Australia, New Zealand, Nigeria, Hong Kong, Thailand and Indonesia,” explains Isobel Sobey. 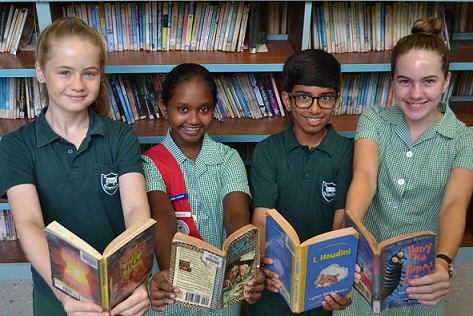 “The four members in our team are all on Grade 7 and are avid readers with deep interest in books. They have read and worked hard for this since Grade 1 and are deserving winners. They will have a wonderful time in New Zealand and soak up all the lessons and experiences that come their way.